The original sliding companion way hatch rotted and split lengthwise. It was falling apart so I took the plunge and decided to try to build a replacement. My woodworking experience was about nil, so don't be too critical! I show this as a example of what the rest of us can even achieve. 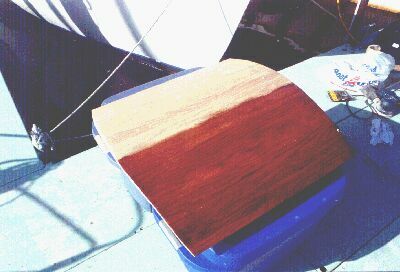 ;-) Teak costing what it does I built this (and companionway boards) out of red oak, and stained with Zar Teak colored stain. Here's the basic piece. I pulled apart the old one and traced the curved ribs onto the new stock. The side rails I cut out the notch underneath with a newly acquired router. Instead of notching the rails for the top I built mine so the top would overhang instead. 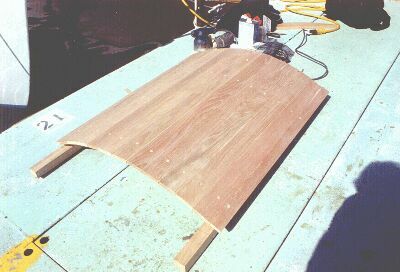 I also decided trying to bend plywood sounded too hard hence I used the 1.5 inch wide strips and built it plank style. 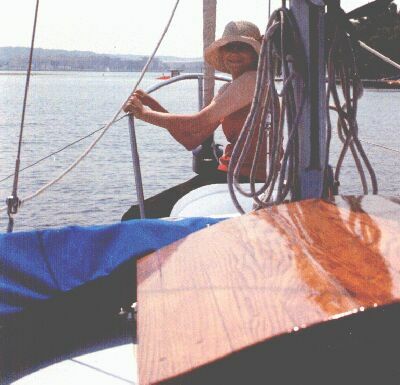 The SS screws were counter sunk, and each piece was epoxied into place. Liberal sanding smoothed out the stair steps of the 'planks'. Then wood putty filled the countersunk screw holes and the very small spaces between the planks. The planks edges were touching on the bottom, but had a small gap between them at the top. This could have been eliminated by beveling the sides of these 'planks', but since I was building this on the dock without a woodshop I opted for just filling in with stainable putty. I thought I'd get away with this since I coated the whole thing with several coats of epoxy to seal it up from any water. At this point I've drawn a curve on the back with pencil and string and cut the curve and cut the rails to length. Now we've got the first coat of epoxy on. 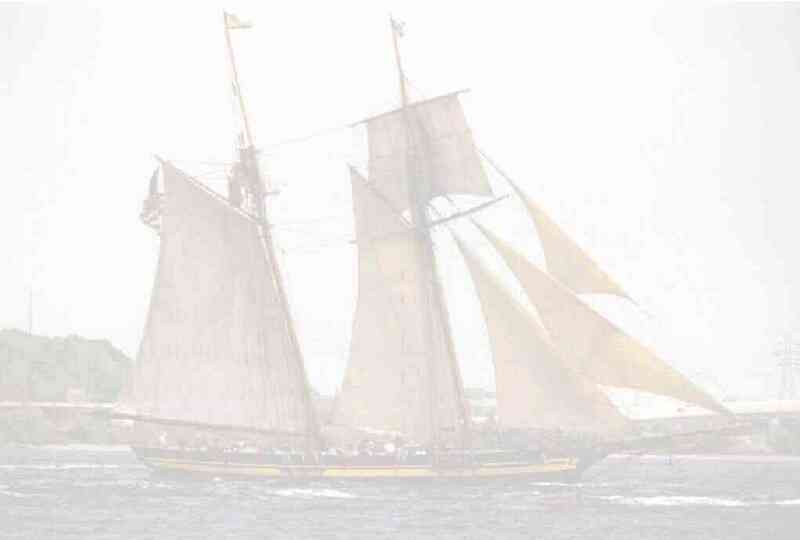 Here's how it looks on the boat. I've got about 5 coats of epoxy on it and a few of varnish. 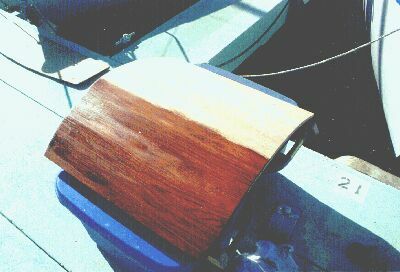 Epoxy is not UV stable so it needs paint, gelcoat, or varnish to protect it. It's not perfect but a lot stronger and more attractive than the rotting white plywood original.